As always, lack of posts does -NOT mean lack of activity. We get a groove and enjoy the ride. That being said, Friday Nights at The Wheel Mill are again a thing. AND- We kick off our 10th indoor season of FREE unicycle classes at the Butler Y starting December 1st. As always, we're there on Saturdays from 4:30-6:30 pm and admission is FREE! Make it a point to learn the fun of one before the end of 2018! #UnicyclesAREaTHING - Especially in Pittsburgh! It may appear that not a lot is going on since our last post was 2 months ago. On the contrary, we've been busy. Summer is the time to get outside and this one is no exception. We've been regularly attending #unicyclesareathing on Friday nights at Southside Riverfront Park in Pittsburgh (when it hasn't been pouring rain!) Attendance there has been solid with well over 2 dozen people a night (sometimes we see as many as 40) showing up to give unicycling a try for the first time, or just to practice beginning skills. We've also been to both Open Streets in Pittsburgh. That's ALWAYS a fun time- especially since the last event broke attendance records with over 45,000 people! While we don't get everyone in attendance to try a uni, we do stay busy getting new people in the saddle the entire time. We don't keep count, but 40+ people a day is a low estimate. 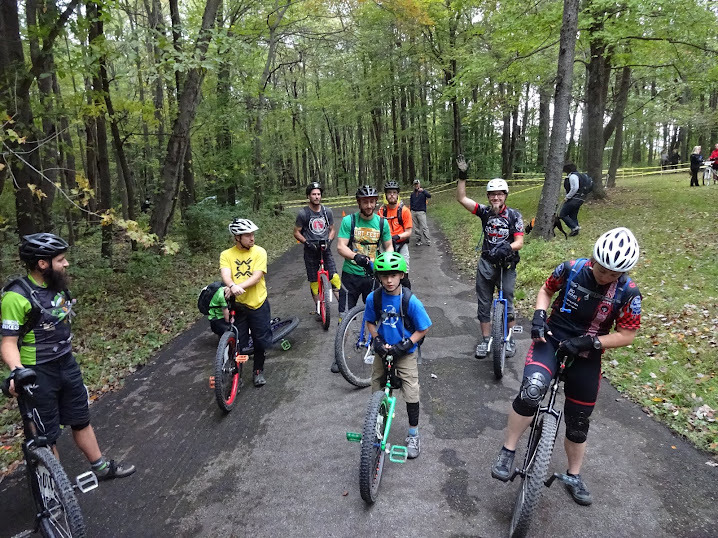 In addition, several of us attended The North American Unicycling Convention and Championships (NAUCC) in Livonia, MI. Again, we proved that the Butler Wobble and Pittsburgh region have some strong riders with some 2nd, 3rd, and 4th place overall finishes in Cyclocross, XC Muni, Criterium, 10k, and Marathon (yes, that's 26.2 mi). And lastly (for now) we headed to Dirt Rag's Dirt Fest in WV for some uni fun. We had a great muni group ride with a couple of new to us faces and then had a try a uni booth where we got some folks to not give up their bikes, but to see what the buzz is all about. More Friday nights with THICK Bikes and #UnicyclesAreAThing, Open Streets July 28th, more beginner friendly rides, and more group rides. That should get us through summer. We hope you'll join us and ride a uni. It's super low risk, a great workout, and fun! Just because uni means one, doesn’t mean you need to ride alone! Saturday, March 31st, is the last indoor day at the Y. No worries, we will resume in November. Also, The last day for The Wheel Mill Fridays we will be attending is April 14th. The uni discount is still available Friday nights, it's just that the regular crew will shift outside for the season. In the meantime, #unicyclesareathing with THICK Bikes begins on Friday, April 21st at Riverfront Park on the South Side of Pittsburgh. These free sessions are weather permitting and run from 6:30-8:30pm. Check with THICK Bikes for details. It's been a great season. It's not over yet. If you've wanted to try a uni, you've still got options!